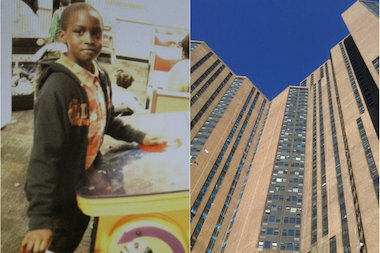 The building that Sidy Fofana, 9, fell from has a history of open violations with the city's Department of Buildings. MORRIS HEIGHTS — The high-rise apartment building from which 9-year-old Sidy Fofana fell to his death in late April racked up so many violations with the city's Department of Buildings that it was hauled into criminal court, city officials said. The apartment complex at 20 Richman Plaza had 12 open violations with the DOB as of last Thursday, spanning from Aug. 7, 1999 to Sept. 9, 2011 — 10 of which the agency classified as either "hazardous," "immediately hazardous" or a "major" violation. Sidy plunged to his death from the building on April 23 after relatives said he visited his uncle on the 43rd floor to get money to buy food. His death appears to be an unfortunate accident, according to the NYPD. There was no evidence of criminality, and no one has been charged with wrongdoing, police officials said. The Medical Examiner has not determined the cause of death more than a month after the incident. Several of the open violations at the building were related to broken elevators, and 10-40 Richman Plaza had been No. 7 on the department's list of top 10 elevator offenders as of March 7, 2013. The DOB updated its list on May 13, and 10-40 Richman Plaza is not on it. The building racked up 57 violations between 1996 and 2011 for offenses ranging from broken elevators to not providing knobs on the 39th floor exit doors, according to DOB records. Harlem River Park Houses, the former owner of 20 Richman Plaza, was referred to Bronx Criminal Court under the DOB's elevator enforcement program. There it pleaded guilty to violating the building code for not maintaining elevators and was hit with an $18,750 fine. Harlem River Park Houses, a company that is listed as inactive with New York State, did not respond to multiple requests for comment. The building was hit with fines as high as $2,963.56 for its open violations and has continually failed to file paperwork showing the problems have been fixed, according to DOB spokeswoman Kelly Magee. "They’re going to court and they’re paying their fines," she said. "They’re just not submitting that certificate to us that says, 'We’ve done the work and it’s completed.'" There is a chance that the ownership has resolved these violations and just not sent in the paperwork, Magee added. Ronn Torossian, spokesman for building manager River Park Residences, said the company purchased 20 Richman Plaza on Dec. 31, 2012, "and these violations were all inherited from previous management." But the building has had two open complaints since then, in September 2013 and March 2014. Both were for broken elevators. “This management group purchased a distressed property," Torossian said in an email. "While we work and renovate, naturally issues arise." Magee confirmed that the DOB is investigating two complaints at the building concerning elevators. The most recent DOB violation at 20 Richman Plaza was on June 26, 2013, and concerned work being done without a permit, according to DOB records. It was dismissed. The property is undergoing a three-year, $110 million renovation, said Torossian. This includes converting to gas heat, renovating the lobbies, installing a new DVR security system with about 1,500 security cameras and the "completion of elevator modernization," among other things. "There will also be substantial improvements within the dwelling units," Torossian said.